Tony is one of the nicest, hardest workers you will ever meet. This young Man is eager to make sure you are happy with everything he does, and always shows up with a smile. If you ask him to do something, he does it with a good attitude and he makes sure its done properly. 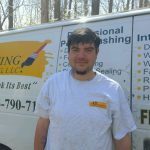 Tony has a natural talent when it comes to painting, power washing, staining and cleaning up after the job is complete. So when you see Tony on your project, rest assure, you are in good hands.